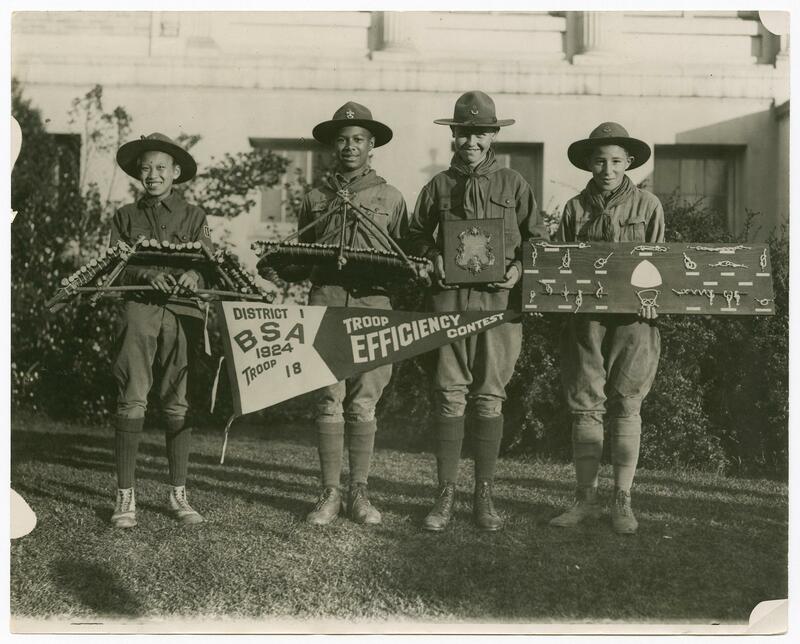 Photo of four Boy Scouts holding up various projects, including a plaque, and a board of knots. They are from left to right--Lincoln Chan, Cyrus Cooper, George Sanford, and Phillip Muller (names handwritten on the back of the photo). From the Oakland Tribune, October 29, 1924: The boys are winners from Clauson School Boy Scout competion and are displaying some of their work. The competition was for the month of September. A photograph that showed a larger group of Boy Scouts was used in the Oakland Tribune, instead of this one, although the four boys listed in this photo were also included. The photo printed in the paper appeared with only a caption and no article.